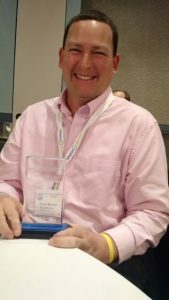 Greenville SC- March 13, 2018-Wayne Benson, Field Operations Manager for Greenville Water was recognized by American Water Works Association South Carolina Section as the 2018 Distribution Operator of the Year. This award recognizes those in the water industry who have achieved excellence in operation and maintenance. This attainment represents a significant accomplishment for Wayne and Greenville Water. Wayne began his water career 20 years ago with Greenville Water as a Field Operations Tech I. He learned the basics of the installation and maintenance of water meters, water pipe, fire hydrants and water valves. In 2016, Wayne was promoted to the Manager of the Field Operations Department, which provided an opportunity for him to formalize and grow the Operations and Maintenance Programs. Wayne sets an example for the 58 members of his department by improving himself with hard work and continuing his education. Wayne will receive his Associate’s Degree in Business later this year. Wayne humbly attributes all his success to the dedicated men in his department. Greenville Water’s Chief Operations Officer, Rebecca West, is excited to see what our future holds with Wayne’s continued leadership and influence throughout the organization. “Wayne’s hard work and dedication to improving himself and Greenville Water is a great example to all of our employees. We congratulate Wayne on this prestigious recognition,” says David Bereskin Chief Executive Officer.